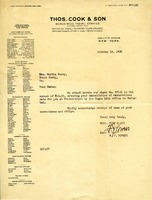 Mrs. Thomas J. Stevenson wishes to donate a box, partly clothing and other useful items, for use by the Berry Schools. 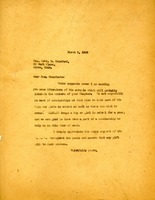 This letter to Miss Martha Berry from Thos. Cook & Son is a check covering the cancellation of a reservation at Oberammergau by the Wagon Lits office in Carlsbad. In this letter, Miss Berry writes Miss Alice S Coffin in desperation for donations during "one of the hardest years in our history. 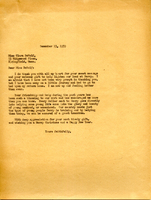 E G Liebold, General Secretary to Henry Ford, replies to Miss Martha Berry about a car she had requested. New improvements are forthcoming and Mr. Ford wishes to wait to incorporate these in the car. This letter from Martha Berry to Mrs. Crawford asks for donations for scholarships for current and future Berry students. Martha Berry also sends literature to help interest Mrs. Crawford's DAR Chapter. In this letter, Mr.William Rogers writes Miss Berry and continues his donating to the Berry Schools. He wishes her well, in a very personal manner, and hopes for her good health.